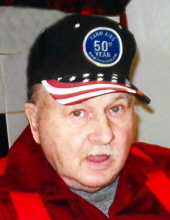 Leroy R. Moeller, 77, of Keokuk, formerly of Salem, Iowa, passed away at 2:38 p.m., Sunday, February 3, 2019, at Unity Point - Keokuk. Survivors include three brothers: James (Eileen) Moeller of Washington, Iowa, Bernard (Donna) Moeller of Keota, Iowa and Robert Moeller of West Point, Iowa; three sisters: Ruth Ann (Glen) Taylor of Fort Madison, Iowa, Barb (Ron) Niehaus of Sperry, Iowa and Carol Kulpa of Newton, Iowa. Also surviving are several nieces and nephews. He was preceded in death by his parents; one sister: Francine; one sister-in-law: Florence Moeller; two brothers-in-law: Walt Kulpa and Al Smith and one nephew: Daniel Moeller. The family will receive friends from 9:30 a.m. to 10:30 a.m. Thursday, February 7, 2019, at St. John the Baptist Catholic Church in Houghton, Iowa. To plant a tree in memory of Leroy R. Moeller, please visit our Tribute Store. "Email Address" would like to share the life celebration of Leroy R. Moeller. Click on the "link" to go to share a favorite memory or leave a condolence message for the family.